Last Thursday, August 4, the Hanley Team visited Peak’s Island for dinner and an afternoon together. Resilience is a part of our Leadership Development Courses and the Maine Islands are a fantastic place to practice. 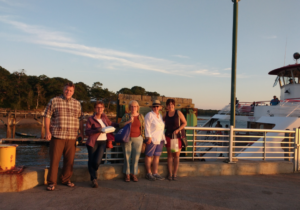 After visiting both of the beaches on the island, the Inn at Peak’s Island hosted our dinner and we got to know each other better outside of our work together. We returned refreshed and looking forward to a busy September.